Landscape view of colonnaded path and temples at Palmyra, Syria. Courtesy Institute for the Study of the Ancient World. The Islamic State is erasing my memories again. I’ve written here before about how they wrecked the Assyrian sites around Mosul and destroyed the unique desert city of Hatra, both in Iraq. Many of the photos I took there can never be taken again. Now they’re turning their sights on Syria’s heritage. Losing territory to the Kurds in the northeast, and realizing they can’t easily push into the Shia areas of Iraq after vowing to kill them all for apostasy, Islamic State is making a renewed offensive to the west into Syria, a divided and mostly Sunni region where they have a better chance to gaining ground. It was in Syria, in 1993 and 1994, where I first got a deep appreciation for many aspects of Arab culture and gained fond memories of visiting the country’s matchless archaeological sites. 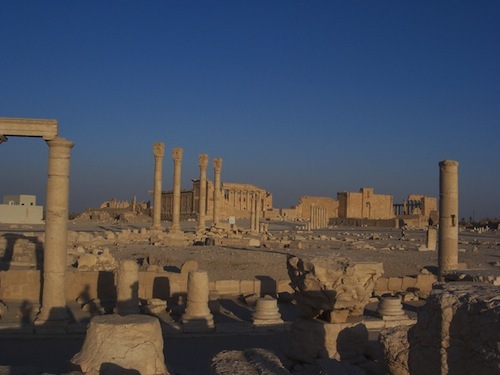 Roman-era remains at Palmyra. Photo courtesy Frank Pecchio. 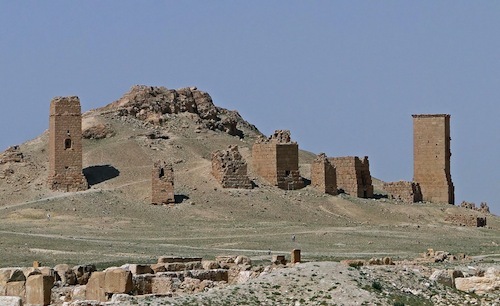 One of the best was Palmyra, an oasis in the desert of central Syria that for 4,000 years has been a stopping point for merchants and soldiers moving between Mesopotamia and the Mediterranean. For centuries it was an independent city-state and fought the Roman Empire to a standstill. Even after eventually losing to them, the Palmyrenes kept their own architecture and religion. The rickety bus from Damascus took all day to cross the desert, passing along a narrow highway through featureless, rocky plains. Every now and then there would be a cluster of Bedouin tents. The traditional black goat’s hair tents I saw in Palestine and Egypt were no longer in vogue here, having been replaced with Army surplus tents, castoffs from one war or another. 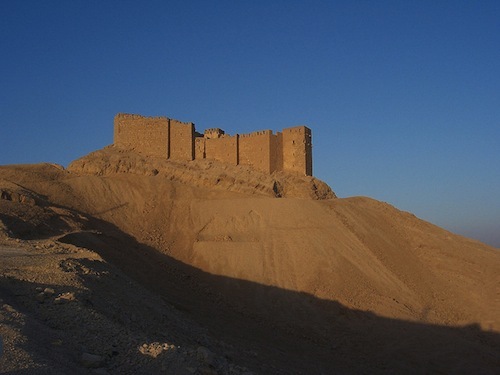 Arab castle at Palmyra. Standing atop its battlements offers a sweeping view of the city, oasis, and surrounding desert. It has been hit hard by artillery fire in the civil war and no longer looks like this. Photo courtesy the Institute for the Study of the Ancient World. The oasis of Palmyra. Photo courtesy Ed Brambley. 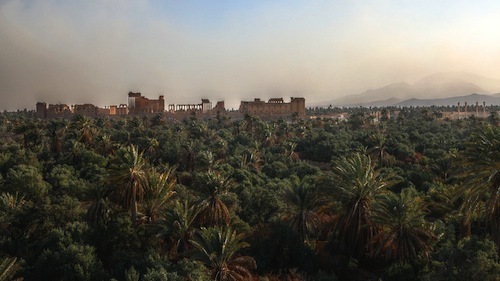 And then Palmyra came into view, a lush green cluster of palm trees and cultivated fields in the middle of a vast nothing. The modern city of about 4,000 people was huddled to one side in low concrete buildings. To the other side of the oasis stood the ancient city with its thick-walled temple to Baal, its grand colonnaded avenue, its Roman theater, and beyond, at the foot of some hills to the west, an eerie stone forest of funerary towers. Palmyra had a small but steady trickle of tourists at the time, just enough to make the Syrians accustomed to foreign faces and not so much that it had been filled with pushy hucksters like the ancient sites of Egypt. Syrians are a Mediterranean people, and share in that laid-back cafe culture. I remember one evening sipping powerful coffee from a tiny cup while watching music videos with a local cafe owner. The videos were all Syrian or Lebanese, and I fell in love with a Syrian singer named Moona. I was in my twenties and fell in love easily then. She was gorgeous, with luxuriant black hair and an oval face with eyes like a doe. And unlike a lot of gorgeous people in music videos, she actually had talent. The cafe owner was in love with her too. Tower tombs of Palmyra. Photo courtesy Bernard Gagnon. Of course the small tourist trade had created some local entrepreneurs. Out in the funerary towers a young boy started tagging along with me, as young boys in the Arab world always do. They love practicing their schoolroom English. This little guy kept pointing out one particular funerary tower, and I eventually made my way there. On the steps leading inside he had a little shop of cheesy tourist trinkets. He wasn’t phased by my lack of interest and kept tagging along, practicing his English for the rest of the afternoon. Inside the funerary towers are these busts of the deceased. Many still have remnants of paint. Photo courtesy Wikimedia Commons. Back in town I visited the dusty interior of the folklore museum. A grizzled old cross-eyed man gave me a tour with a few stock phrases–“not now, all finish” for the obsolete tools and Ottoman fashions, “still today” for the newer items, and “my wife” for the women’s clothing. Once the tour was finished he called me over with a conspiratorial air and pulled out the worst imitation ancient coins I have ever seen. I didn’t need a degree in archaeology to know they were fake. They were all shiny and new. One bore a proud bust of Tiberius on the obverse, and on the reverse had a Greek theater mask and some Arabic writing. Some of the supposedly Roman coins were made of aluminum. When he asked me if I’d like to buy them I laughed. To his credit, the guy laughed with me. 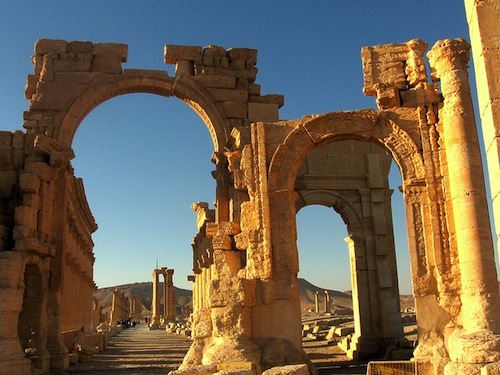 Palmyra was a good-natured, easygoing city until the Syrian Civil War. And now the Islamic State has moved in. 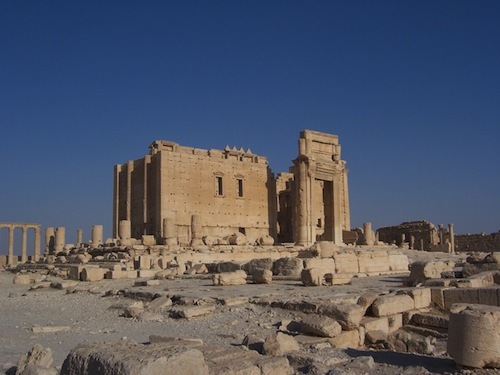 Temple of Baal, courtesy Erik Hermans and the Institute for the Study of the Ancient World. 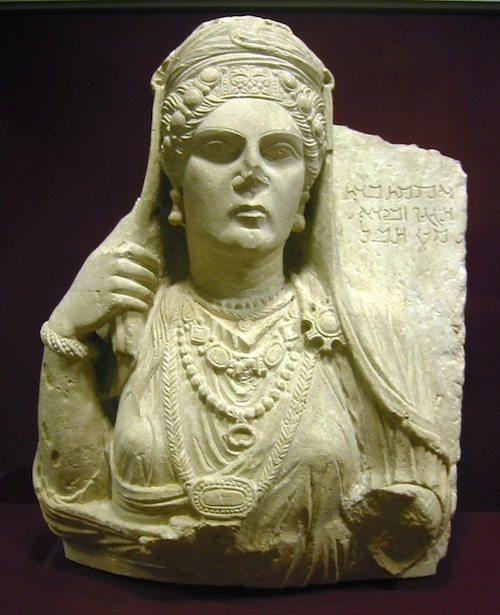 Luckily, the Syrian government moved most of the museum’s antiquities to Damascus, where they’re safe for the moment. But some artifacts were too big to move, including carved stone sarcophagi which the soldiers of ISIS will smash. They also couldn’t move the Temple of Baal. Being a place of pagan worship, it will probably be dynamited. The delicate painted busts inside the funerary towers, protected for two thousand years from the harsh sun and gritty wind, will be chiseled off. And then there are the people, who according to reports are mostly still in Palmyra. That boy with his little shop in the ruins is a man now, fighting for one side or another or simply trying to keep his family from being killed. If some other little boy took his spot, he will be forbidden to work in such a pagan place and will forced into the Islamic State’s youth brigade, which recently brainwashed a twelve-year-old boy into murdering someone for their propaganda machine. And of course there will be no more music videos in the cafes. If ISIS ever catches up with Moona they’ll kill her for her “immodesty”, although her real crime is being an independent woman. And the guy in the folklore museum with his aluminum coins? Well, he’ll be out of a job once they close the museum, and they’ll probably publicly execute him for trading in human imagery. I should have bought those coins. He might have used the money to get out of Syria. Sean McLachlan is the author of the historical fantasy novel A Fine Likeness, set in Civil War Missouri, and several other titles, including his action series set in World War One, Trench Raiders. His historical fantasy novella The Quintessence of Absence, was published by Black Gate. Find out more about him on his blog and Amazon author’s page. Photos courtesy the Institute for the Study of the Ancient World unless otherwise noted. I didn’t have the time to scan my old instamatic shots, and to be honest I couldn’t bear looking at them. I just picked up your book Trench Raiders. It looked good. Thank you for these pictures. It is heartbreaking what is going on over there. I’m reading about 80 year old women and Christians getting burned alive, scores of teenage girls forced into being comfort prostitutes for these brutes. Of all the barbarity that those lands have seen over the ages I think this latest wave is the worst of the worst. I hope those people you write about escape to safety but….they probably won’t. Thank you for these pictures Sean. Watch your six and get back safe. I’ve been thinking about you since your last post and I’m hoping you won’t end up as news. All the best to you sir. I’m literally shaking with rage thinking about these things. One of my first books was a giant time/life book “The Epic of Man” full of excellent paintings and photos of pre-history and history. The human headed lion gryphon things they smashed in Nimrud were one of the things that got me interested in the past and in mythology/fantasy. When people claim there’s a lack of evidence for lost periods of human history, such as the ages of Atlantis and Mu – well look no further than things like this. Sean, would it be all right with you if I pinned these photos (with attribution, of course) on Pinterest? These photos aren’t mine. I didn’t have the time to dig out my old instamatic snapshots from 1994, and I didn’t really have the willpower to look at them. Too depressing. These are all Creative Commons share alike /attribution photos, so if you click on the images you can get to the original source and cite them.